February 19th, 2014 | Posted by Velda in ACUPRES.,MERIDIANS, REFLEX. Head discomforts of all kinds can be harmonized utilizing finger holds and certain flow patterns from the Jin Shin Jyutsu Self Help Books by Alice Burmeister. 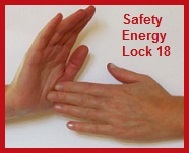 Try these simple methods each time you have a headache: Hold your thumbs including the pad of the thumb, aka Safety Energy Lock 18, left then right for approximately 2 minutes. This will also help you de-stress and relax. For migraines or any chronic/severe headaches, the trick is to bring energy down to your feet. Try these steps when you feel an onslaught of discomfort in your head: Sitting or lying down, using your right hand reach towards your right foot and touch the area just below your ankle bone where you feel the ‘hollow’ area, aka Safety Energy Lock 16, outside the heel. Do the same with the left hand for your left ankle bone area. 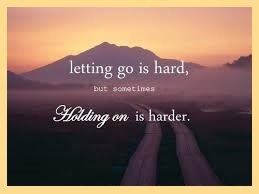 Hold both until you feel a pulse. Next with your right hand use all your fingers to touch the base of the thumb. Hold until you feel a pulse or for 5 minutes. Next hold your head where you feel the migraine or pain(s) until you feel a pulse. Finish with the ankle holds again. Location: (See location on diagram). The Lung 5 acupoint is located on the inside of the elbow at the tendons outer edge in the hollow crease where the elbow is slightly bent. Technique: Support the elbow in the fingers of the opposite hand and locate the acupoint with the thumb. Apply acupressure perpendicularly and repeat on opposite arm. Benefits: Using acupressure on Lung 5 clears heat from the lungs, unblocks fluid congestion in lungs, treats coughing, asthma and colds. Yesterday we looked at treating the chakras with reflexology on the feet which is covered in the book The Reflexology Manual, by Pauline Wills. The author recommends to immediately follow by treating the spinal reflex on the thumbs. The spinal reflex lies on the medial edge of the hand from the base of thumbnail to crease of wrist. 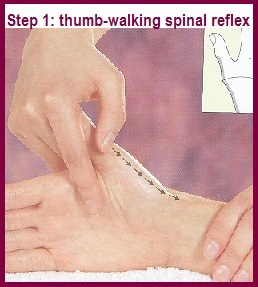 Start the spinal reflex thumb-walking at the base of the thumb nail. The pressure is applied only by the thumb not by any of the supporting fingers. Imagine the thumb is taking tiny steps towards the wrist. There is pressure applied with each step, then pull back without loosing contact. Again take one step forward, press, and pull back. 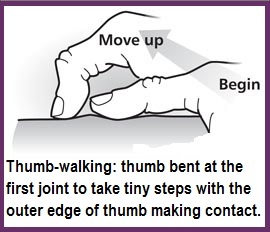 Start thumb-walking the spinal reflex at the crease of the wrist and move slowly up to the base of the finger nail. This is an amazing treatment for keeping the chakras balanced. In Pauline Wills book, The Reflexology Manual – An Easy-to-Use Illustrated Guide to the Healing Zones of the Hands and Feet, she describes how to do a reflexology treatment on the feet or hands for the seven major chakras. Today we will look at practicing this treatment on the feet. Please follow the diagram above for each individual chakra location. (Caution, if pregnant, please see qualified reflexologist for treatments). Before starting reflexology on the chakra points, lets learn more about the pivoting technique you will be using. 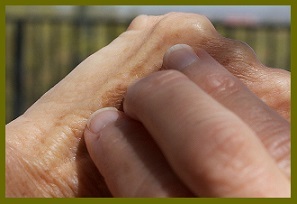 Position thumb and finger as shown in the photo. Use the outer edge of the thumb, press on the point and slowly and gently pivot on it, keeping your thumb in contact with the foot. Begin with the right foot. You will start with the crown chakra moving down to the root chakra. Work with the pivoting technique for five to ten seconds on each chakra. The chakras are worked in this order because energy rises from the base chakra. Working from the crown chakra clears the pathway for the energy to rise. Repeat treatment on left foot. Tomorrow we will learn about the spinal reflexes treatment on the hands that the author recommends doing following the work done today with the chakra points. Location: Inside base of big toe, near where it joins the foot in the bend and next to the second toe. 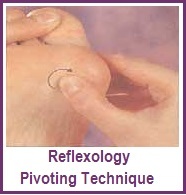 This reflex point corresponds to the neck and throat. Treatment: 1. 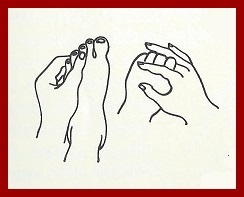 Gently pull and manipulate one of your big toes. Bend several times slowly. 2. Massage the lower joint with your thumb. At the base of the big toe, walk your thumb across the bend and then continue walking the thumb slowly up the outside of the toe using a firm pressure. 3. 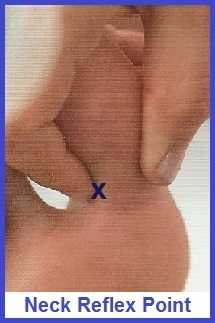 Press your index finger or knuckle against the reflex neck point spot (x shows location in photo) for about thirty seconds. 4. Repeat the process on the other foot. To enhance results you can use a massage oil or lotion that contains essential oils of lavender or clary sage which will help reduce tension. Lu 1 acupoints, are helpful when wanting to letting go of grief and emotions that are causing pain. Lu 1 helps with fatigue, irritability and confusion. It is also effective for relieving discomforts related to the lungs: breathing, asthma and coughing. Location: On your front body, three fingers’ width below your collarbone, next to the top of your upper arm bone. These acupoints can be tender and will require gentle pressure when beginning this exercise. 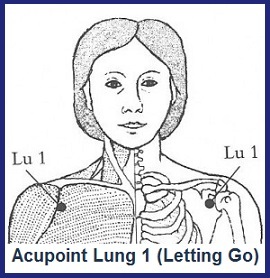 Start: Use your fingertips to press the Letting Go acupoints (Lu 1) at the same time. You can also rub or massage the points with a circular motion. Inhale slowly and deeply as you gradually release your finger pressure, bring your arms outward, lift your chest, and tilt your head back. Hold your breath for a few seconds to assimilate the oxygen. 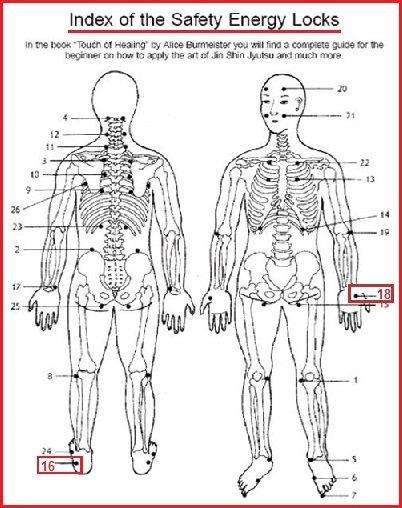 Exhale as your head comes downward and your fingertips return to the Lung 1 acupressure points. Repeat this exercise four or five more times. 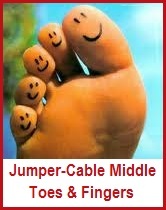 Jumper-cabling together the middle toes and middle fingers is a general harmonizer especially for the respiratory and digestive functions. It promotes optimal and healthy production of milk for mothers who are breastfeeding. It also helps release tension and stress from the knees. 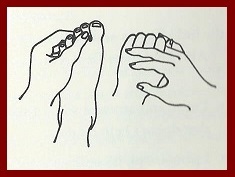 To practice this Jin Shin Jyutsu® exercise correctly, as described in The Touch of Healing by Alice Burmeister, please check proper holding positions shown in the above illustration. 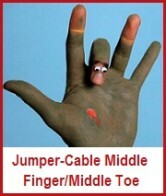 Always remember to jumper-cable both hands and feet. • I’m tired. I look haggard. • My eyes are giving me problems. • My digestion is giving me problems. • I have speech problems. • I have hearing problems. • I’m always hyper-I can’t relax. 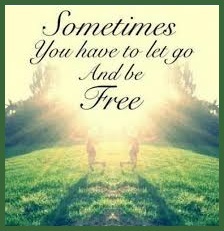 • Reduce fear and depression. • Release blockages that cause bloating, fluid retention, and gas. • Hold whenever you feel insecure, afraid, or lonely. • Can affect the functions that revitalize bones and bone marrow. • Can help babies eliminate discomforts related to teething and drooling. • Promotes healing of teeth and gums. • Revitalizes liver, gall bladder, spleen, pancreas, and diaphragm functions. • Can strengthen back and respiratory system. 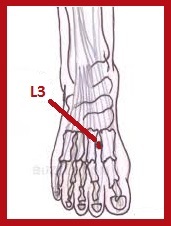 Liver 3 (Great Pouring) is an important acupressure point for self-healing. It is a soothing point, calming the mind and relieving spasms. It subdues excess yang or stimulates stagnant energy in the liver, which helps facilitate the relief of migraines, frustration, anger, and the symptoms of premenstrual syndrome. It strengthens the liver, besides overcoming the effects of exercise, stress, strain and toxins in the body. Location: The web between the bones leading to the big toe and second toe (as shown in the pictures). Place the fingers under the foot for support and press into the point with the thumb being careful to apply pressure in the hollow between the bones and the tendons rather than on the tendons. There may be some tenderness. Rub in small circles and imagine you are spreading chi (energy). Repeat for other foot.